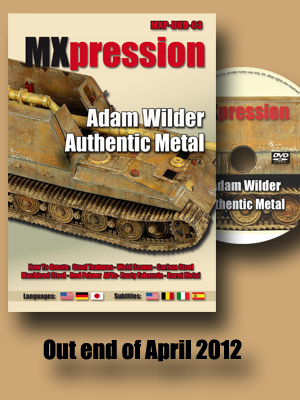 Due to be released at the end of April MXPression has used noted Armour expert modeller Adam Wilder to host their latest video on AFV modelling. This edition focusses on trying to get the most out of your armoured vehicle kit, hopefully after watching the full thing we can approach the level Adam is on!!! (fat chance but we can try) - here is the video preview - it looks impressive!! - Running Time 98 mins. "Well known AFV modeller Adam Wilder has teamed up with MXpression to share some of his trademark techniques. He shows all the secrets needed to give plastic the unique look of metal. Starting with surface texturing and weld seams he then moves on to raw steel, polished stainless steel and a primed Ferdinand upper hull. After finishing a heavily rusted exhaust Adam finally creates the super realistic side-wall of a burnt M113. This DVD will surely be a great inspiration for beginners and advanced modellers alike!" The DVD, due out at the end of April this year comes in English, German and Japanese languages and has English, Belgian, Italian and Spanish subtitles so they really didn't leave too many modellers out! Check out the MXPression website for more information on this and their other titles and products.